Observing the soil from the property. Deliverance is a three-fold process consisting of: (1) Spiritual deliverance, (2) Physical deliverance and (3) material deliverance. 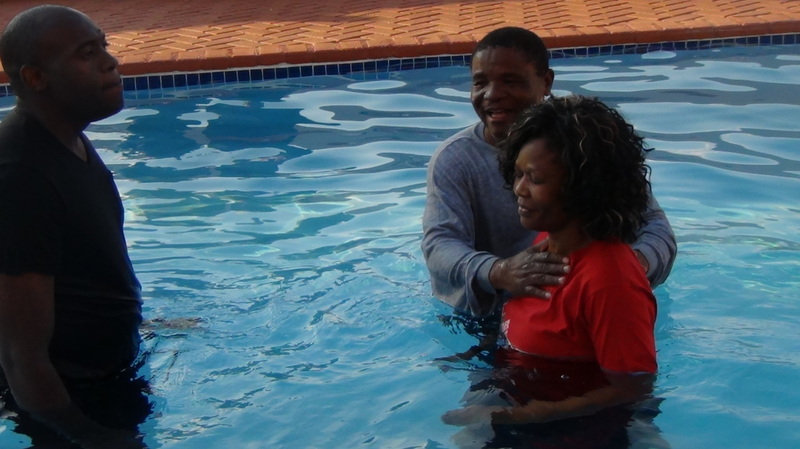 All these processes of deliverance are to be done after the person has completed salvation. PHYSICAL DELIVERANCE and MATERIAL DELIVERANCE affect mainly those whose lives have been dedicated to ancestral idol worship. 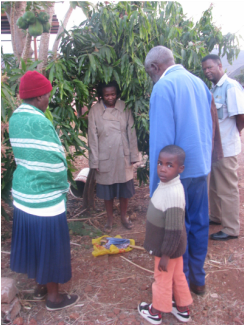 The rituals done during idol worship gives power to the enemy in instances where you or your name has been dedicated to the ancestral spirits and idols. These spirits / idols sometimes punish the children for the sins of their fathers. Ancestral idol worship works hand in hand with witchcraft spirits. Most inherited sicknesses, generational curses, poverty, divorces; closing of womb, and sending of demons to people is as a result of idolatry. The spirits punish the people for their failure to bow down to these spirits / ancestral idols. These spirits then interfere with your material possession as they don’t want you to have money or to prosper materially. So they will kill, steal and destroy all your material wealth, opportunities etc. In the case of material possessions, we find that most Christians are staying in houses that have not been dedicated to God. The bible tells us that God spoke to Moses about dedications:“7 Seven days you shall make atonement for the altar and sanctify it [set it apart for God]; and the altar shall be most holy; whoever or whatever touches the altar must be holy (set apart for God's service).” Ex 29:37, AMP. [for cleansing] and its base. 29 You shall sanctify (separate) them, that they may be most holy; whoever and whatever touches them must be holy (set apart to God). 30 And you shall anoint Aaron and his sons and sanctify (separate) them, that they may minister to Me as priests.” Ex 30:25-30, AMP. “9 You shall take the anointing oil and anoint the tabernacle and all that is in it, and shall consecrate it and all its furniture, and it shall be holy. 10 You shall anoint the altar of burnt offering and all its utensils; and consecrate (set apart for God) the altar, and the altar shall be most holy. " Ex 40:9-10, AMP. The scriptures on dedications are numerous in the bible. 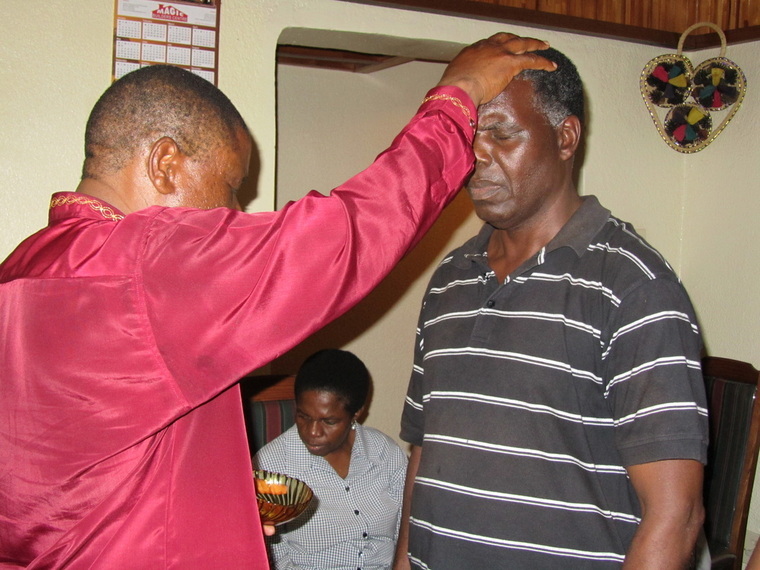 On 25 October 2011 Tuesday Ps Shingange's home was dedicated to the Lord. JUST CLICK THIS PHOTO ON YOUR LEFT TO LISTEN TO THE AUDIO MESSAGE. When the link opens Just click on the message of your choice. Listen to the message for a clearer and better understanding of house dedication and the purpose thereof. If you need more mp3s or even videos of dedications (house, church, businesses) please contact our administrators to place an order. We can post the material to you. 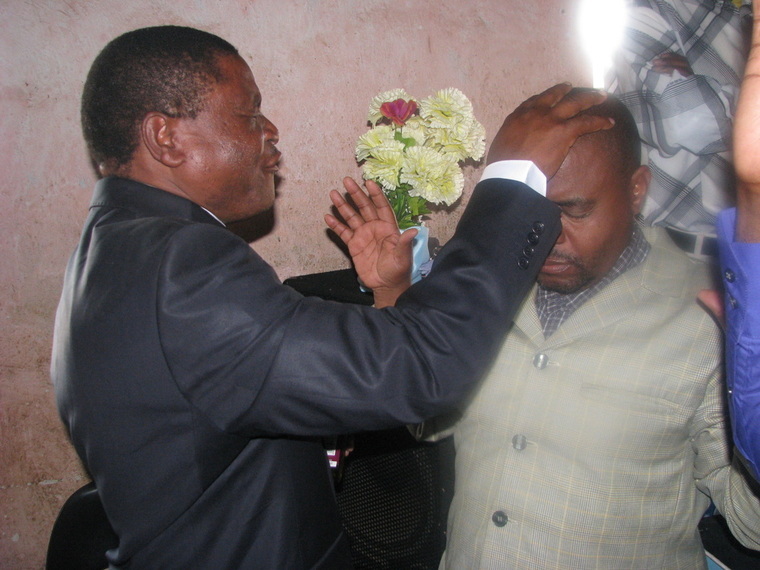 Rev Mametsa ordaining Ps P Lishivha as a deliverance minister. Our houses are our altars of prayer where we draw our power from. We need to be blessed when we come in and be blessed when we go out. “6 You will be blessed when you come in and blessed when you go out.” Deut 28:6, NIV. We need to carry the same blessing to our different institutes of life: workplaces, businesses, schools etc. As Christians, our presence must be felt wherever we are or wherever we go. A Christian must have a better place where we communicate with God and that place must be dedicated to God so that when we call upon Him, He will answer. The bible says in Ps 137:1-4: “1 BY THE rivers of Babylon, there we [captives] sat down, yes, we wept when we [earnestly] remembered Zion [the city of our God imprinted on our hearts]. 2 On the willow trees in the midst of [Babylon] we hung our harps. 3 For there they who led us captive required of us a song with words, and our tormentors and they who wasted us required of us mirth, saying, Sing us one of the songs of Zion. 4 How shall we sing the Lord's song in a strange land?” AMP. The Israelites hung their harps (vessels used in and for worship of God), as they could not sing to the Lord in a foreign land. 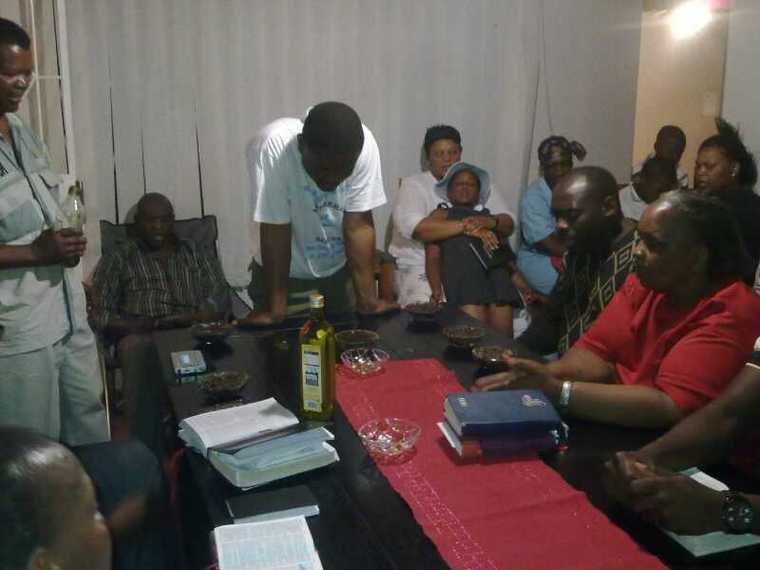 It did not make sense to them to pray God from the wrong place, a wrong house. If you check: 1 Kings 9:1-3: “When Solomon had finished building the temple of the Lord and the royal palace, and had achieved all he had desired to do, 2 the Lord appeared to him a second time, as he had appeared to him at Gibeon. 3 The Lord said to him: "I have heard the prayer and plea you have made before me; I have consecrated this temple, which you have built, by putting my Name there forever. 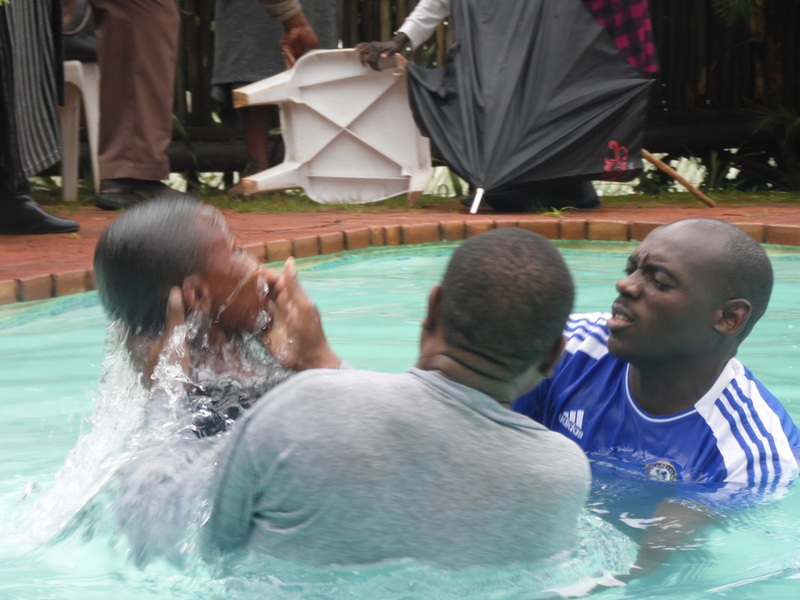 My eyes and my heart will always be there.” NIV. In Jeremiah 33:3 the bible says: “3 Call to Me and I will answer you and show you great and mighty things, fenced in and hidden, which you do not know (do not distinguish and recognize, have knowledge of and understand).” AMP. God says He will show us things which we have never seen. The devil hides his angels (spirits) in our yards in the soil. Amongst the things that God will show us, are these hidden angels of the devil that are hiding in our yards (premises). In Judges 6:23-26: “23 The Lord said to him, Peace be to you, do not fear; you shall not die. 24 Then Gideon built an altar there to the Lord and called it, The Lord is Peace. To this day it still stands in Ophrah, which belongs to the Abiezrites. 25 That night the Lord said to Gideon, Take your father's bull, the second bull seven years old, and pull down the altar of Baal that your father has and cut down the Asherah [symbol of the goddess Asherah] that is beside it; 26 And build an altar to the Lord your God on top of this stronghold with stones laid in proper order. Then take the second bull and offer a burnt sacrifice with the wood of the Asherah which you shall cut down. “ AMP. 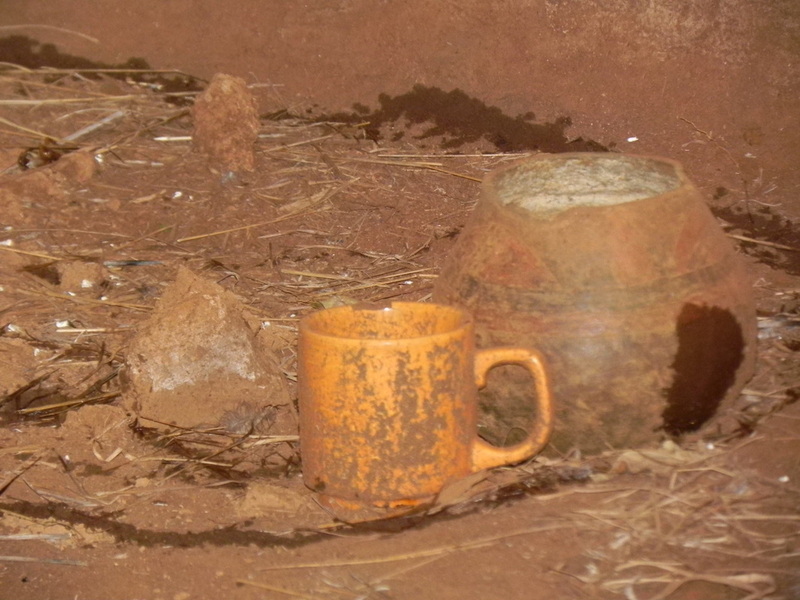 God instructed Gideon to demolish his father’s altar to Baal, as Gideon’s name was recorded in this altar of Baal. Gideon’s father’s altar of Baal was prevented God from blessing Gideon as the altar was giving the devil legal rights to rule in the premises. 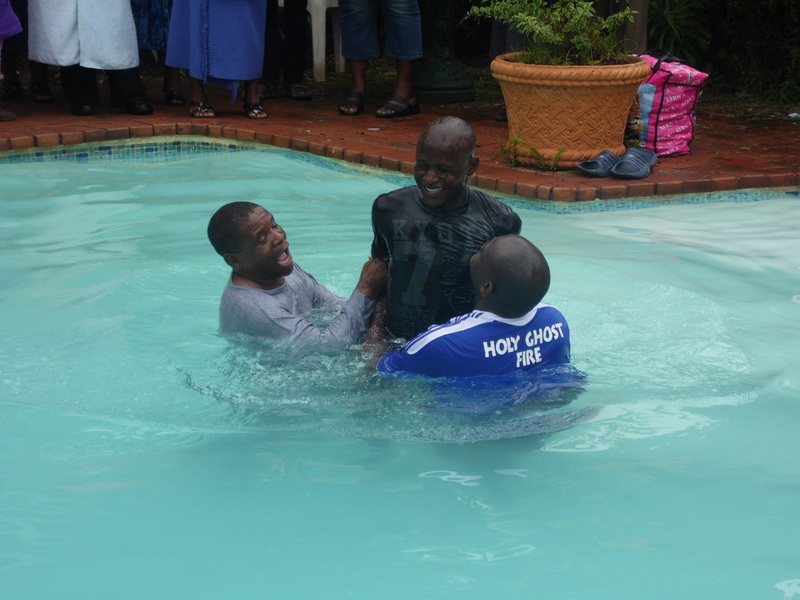 The bible states that after dedication of a house, your house (premises) shall become “most holy”. See also: “9 You shall take the anointing oil and anoint the tabernacle and all that is in it, and shall consecrate it and all its furniture, and it shall be holy. 10 You shall anoint the altar of burnt offering and all its utensils; and consecrate (set apart for God) the altar, and the altar shall be most holy." Ex 40:9-10, AMP. At Mauluma, family looking upon items of ancestral worship: getting ready to renounce the covenants and ancestral worship. 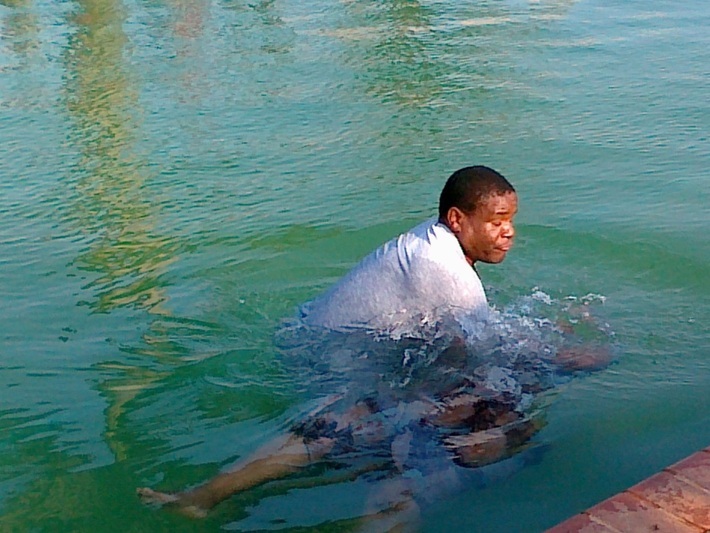 Water Baptism: Believer under water "A believer must be completely immersed under water." 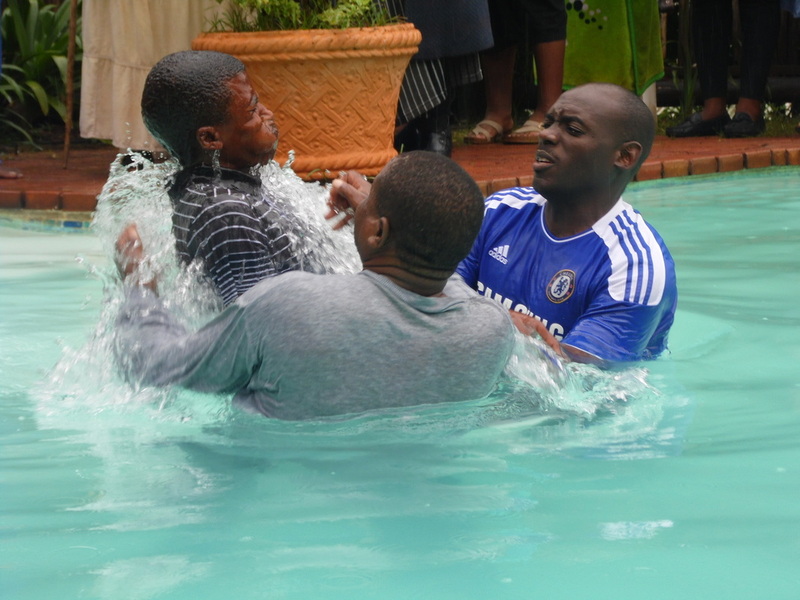 Deliverance Session after Sunday Service. 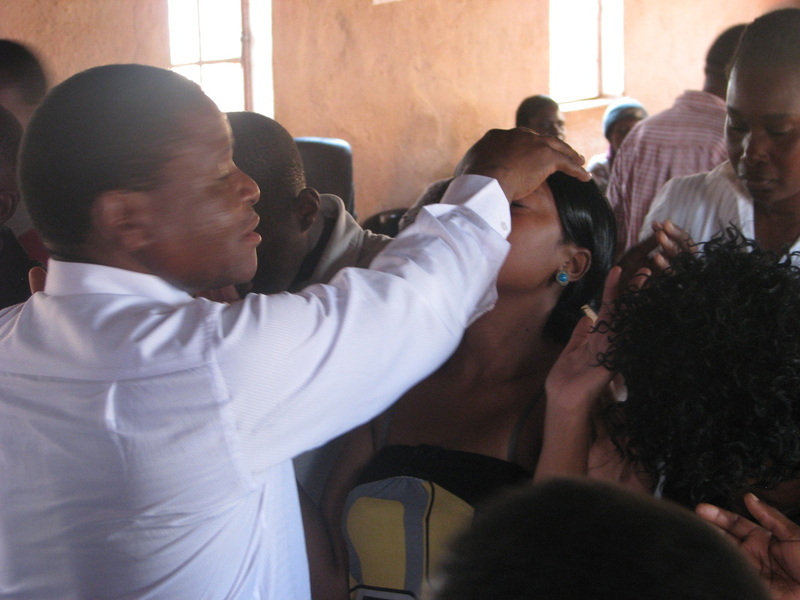 Rev S Mametsa praying for people.